Panel 2: A small green bird stands on a tree branch. 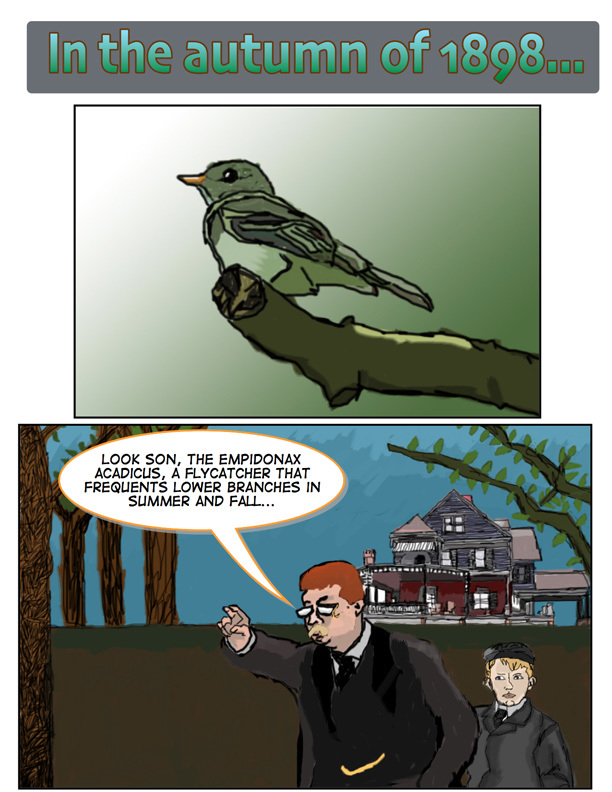 Panel 3: Theodore Roosevelt, in a typical 1890s black suit coat and tie, with watch chain hanging at his waist, points at the green bird off-screen and calls out to Kermit Roosevelt, age 9, who’s right behind him, “Look son, the empidonax acadicus, a flycatcher that frequents lower branches in summer and fall…” This is a bird species that TR described in his ornithological report “Notes on some of the birds of Oyster Bay, Long Island” that launched his career as a serious naturalist when it was published in 1879. In the background there is the Roosevelt home at Sagamore Hill as it still exists today, and on the right and left sides of the panel there are trees, branches and leaves. I’m proud of the original tree bark that I created for the leftmost tree trunk.